Collectors who successfully guess Upper Deck’s “Rookie of the Week” will be entered into a drawing to win a box of 2009 NFL trading cards. For his great performance in both receiving and kick returns, Minnesota’s Percy Harvin has been named Upper Deck’s top rookie of Week 8. If you entered codes from Harvin’s cards last week, stay tuned to the website to see if you are a winner! In all seriousness, I could go on for pages about what Percy Harvin brings to the Vikings squad, but this is more about a rookie that has become more than just another piece to the puzzle. He has explosiveness, speed, great hands, and a fearless attack each time he touches the ball; but more than that, he brings an element to the field that few can match. Whenever Harvin comes into the huddle, teams have to adjust for his many capabilities. That means if he is in the back field, they have to play him like a back with speed and power. If he is in motion, they have to account for the reverse. If he is returning the kick, they have to kick away from him. It’s all part of the problems created for the opposition by a multi-tool player. Oddly enough, when the Vikings drafted Harvin, I was skeptical of his commitment to the game (mostly because he failed his combine drug test). I thought a tackle like Michael Oher would have been a better investment for the Vikings who needed O-line help. Little did I know, Harvin came into camp as one of the most spine-tingling players to put on the purple and gold in a long time. Immediately, Coach Brad Childress commented on the new looks they could give with Harvin in the lineup, and how his play calling could accommodate it. I was pumped. Harvin didn’t disappoint, scoring TDs in his first three games, including a kickoff return of more than 100 yards against the 49ers. He also was the key “go to” part of the Vikings offense, especially on third down, when he became Favre’s favorite target to hit. From that point forward, Vikings fans knew that Harvin was the right choice for the team. Although he had a shoulder injury that limited his production in weeks five through seven, he has still managed five total touchdowns, including another kickoff return and a long touchdown catch in Sunday’s game versus the rival Packers. He has also had 28 receptions for 369 yards, which further illustrates his importance to the team. I’ll be the first to admit that the Packers game was not a slam dunk coming out of the gate, but Harvin did his best to make it look easy. He averaged 35 yards per return on his five chances, meaning that the Vikings had an average field position around the 40 or 45 each time he got the ball. His return in the second half set the Vikings up for a touchdown they needed desperately, and his 51 yard catch looked better than plays I’ve run on Madden. He also had two key third-and-long catches that extended drives, something that was a necessity to beat a surging Packers comeback. Everywhere the Packers defense looked, Harvin was there blowing it up. Because of his college career, Harvin has always had value in the hobby, even before his coming out party against Cleveland during Week 1. Since that point, he has moved into the top of the draft class in the worth of his cards, making every diehard Vikings collector, like myself, very happy. The good thing about a player being at the top is that there are always going to be a lot of choices in the cards that are out there. Harvin definitely falls in that category. 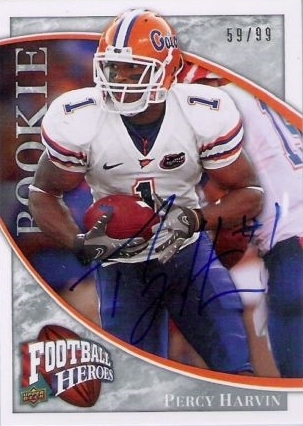 His most sought after cards of the year have probably been out of 2009 Upper Deck and 2009 Philadelphia, where he inscribed “See You Next Year Tebow” on a few of the hard signed offerings from those products. Because the inscriptions were so rare, and because there are a ton of Florida Gator fans, these cards have reached astronomical values. Harvin also has a number of cards in the newly released SP Threads set, with my favorite being his triple auto with other receiver standouts Michael Crabtree and Jeremy Maclin. I can see this one being incredibly valuable a few years from now, as all three have the potential to break out as superstars. Harvin also has some good looking, hard signed, and affordable options in both Heroes and Draft, which should be great for both Vikings and Gator fans alike. These cards won’t break the bank, and you can still get a card that has been handled and signed by the player. I have both, and I think they are some of the better looking cards out there. Lastly, be sure to look for Harvin in both SP Signature edition (being released this week) and Upper Deck Black (released on 11/24), as both sets should carry their value very nicely. The designs look amazing as well, so I know that I will be personally chasing them as soon as they hit. For as much stock as we put into rookies before the season start, there are few that actually produce to their hype’s level on the field. I can guarantee you that Coach Childress may even grow some of his hair back knowing that Harvin has already exceeded some of those expectations. It’s definitely a luxury having a guy that can score on any play, and Harvin is quickly maturing into a role that could be just the person to fill that need.